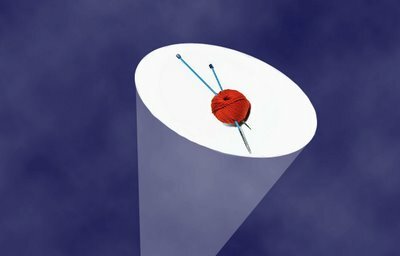 This yarn beacon was designed by me and an old friend years ago to alert the masses when there is some good "yarn stuff" going on. Every knitter has an obligation to be an enabler. I take this obligation quite seriously. I just read in the Michaels ad (in Raleigh, NC) that all yarn is going to be on sale December 26th-January 1. My eyes focused on the Patons Classic Wool for 2.99 (Original price is $4.99). That's right folks. 2-freakin'-99. Patons Classic Wool is the Cascade 220 of the big box craft stores. Hell, it even contains almost the same amount of yarn at 223 yards. People were camped out in front of Best Buy and Walmart for the Black Friday deals on electronics, but I think they had their priorities all screwed up. THIS, my friends, is a reason to camp outside of a store. I kid. But I'm going to be really pissed if the good colors are gone by the time I get there.